This report will uncover the use of an online environment to help students learn mathematics within a geometry class. The curriculum for surface area and volume are specifically being targeted for this report. Initially, there are three sections that will cover the needs, goals, and tasks portion of this endeavor. Five sections that include learner analysis, contextual analysis, instructional delivery strategy, learner objectives, and learner strategies will follow. It is my intent to provide extended learning avenues to students that are being exposed to the mathematics of surface area and volume of solid figures. The students who I have immediate contact are those who are assigned to me as students at a certain high school. Other students will have access to the Internet will also benefit from this venture. Allow me to further explain the details of this venture by providing the reader with the following sections: background, purposes, limitations, questions, process, audience characteristics, results, and recommendations. Students at a certain high school (and elsewhere) typically are placed in learning environments that are not exactly homogeneous. One common problem has teachers dealing with students who have varying ability levels. This venture will deal with varying levels of ability concerning specific areas of mathematics. Surface area and volume of geometric solids are the target areas to be covered. To combat problems in these areas, I will develop online lessons that will be integrated with existing dynamic testing interfaces to help students learn this material. Unfortunately, the limitations of this venture are many. Students at a certain high school suffer from substandard reading abilities and low socio-economics. These two major categories of problems contain subcategories that are more problematic, namely an inability to gain access to the Internet and general learning frustration. An argument could be made that these students consequently feel disenfranchised and become apathetic as a result. 1. Will students want to use online tutorials? 2. Will students want to use interactive online mechanisms? 3. Which multimedia devices might best be used to compliment such a venture? 4. How could this online service best be constructed to maximize benefits? 5. Might there be significant costs related to this online project (bandwidth costs)? 6. Will educational benefits depend on viewer connection speeds? 7. Can project success be measured? 8. How will MATHguide provide online content not found elsewhere on the Internet? Observational analysis throughout a decade of personal mathematics teaching experience indicates that supplementary tools are needed to effectively allow for learning in geometry. Reflecting on the overall results of test scores and semester exam scores (now considered to be anecdotal due to lack of immediate data), it is evident that students be given more avenues for learning. Students will be given a survey during second semester (when the topics of surface area and volume are covered) that will ask them a series of questions related to this venture, found below. Answer each question with a 1 (disagree with the statement), 2 (disagree with most of the statement), 3 (does not apply or have no feeling regarding the statement), 4 (agree with most of the statement), or a 5 (agree with the statement). 1. I used the online content. 2. I found the online content to be useful. 3. I would have benefited more from the online content if I had a faster connection to the Internet. 4. I found the various sounds and pictures of the online content to be helpful. 5. If I could, I would change the pictures within the online content. 6. If I could, I would change the sounds within the online content. 7. I found the lesson to be clear and easy to read. 8. As a result of using the online content, I now understand more about mathematics. 9. I plan on using more online content in the future. The target students who will be using this online content will be mainly Hispanic students. Students will have access to the content in school during class, after/before school in various labs throughout a certain high school, at libraries, at home, and anywhere else they have access to the Internet. Students will receive instruction from me as to how to use the online content. I will provide detailed verbal and visual directions and instructions. I will be available for help after school nearly every day for students who need more assistance. By comparing test scores from the previous years to students who use the online content this year, along with the results of the survey, I will have an idea of the success of the venture. Therefore, the results have yet to be determined. The recommendations depend on the results, which will be completed at the end of the second semester of the 2004-2005 school year. Even though the needs portion of this project is incomplete, feedback mechanisms are built into the project that will allow for revision and continued growth by comparing test scores and analyzing surveys. Upon concluding the topics involving prisms, cylinders, pyramids, cones, and spheres, students will be able to recognize and name the figures. They will also be able to calculate lateral area, surface area, and volume of these shapes. It is the intent of this instructor to further promote these skills with the integration of a multi-faceted, online website on MATHguide [ http://www.mathguide.com/ ]. Below is a detailed arrangement of activities that students will follow throughout the subject matter. The content is broken down into five sections: introduction to solids, surface area, volume, online content, and integration of class activities with online activities. 1. Students will be introduced to five solids: prisms, cylinders, pyramids, cones, and spheres. 2. Students will use pre-existing knowledge of planar geometry to describe characteristics of these figures. a. Students will count vertices (sharp points, where three or more planes intersect on the surface of figures) of various solids. b. Students will count edges (line segments, where two planes intersect on the surface of figures) of various solids. c. Students will count faces (planes on the surfaces of figures) of various solids. 1. Knowledge of area will be transferred to lateral area (walls) of simple surfaces: prisms. 2. Students will solve various problems involving lateral and total surface areas of prisms. 3. Students will be introduced to cylinders and how to calculate lateral area and surface area. 4. Students will calculate lateral area and total area of cylinders. 5. Students will be introduced to pyramids and how to calculate lateral area and surface area with such a figure. 6. Students will calculate lateral area and total area of pyramids. 7. Students will be introduced to cones and how to calculate lateral area and surface area with such a figure. 8. Students will calculate lateral area and total area of cones. 9. Students will be introduced to spheres and how to calculate lateral area and surface area with such a figure. 10. Students will calculate lateral area and total area of spheres. 1. Students will transfer knowledge of planar area and squares to solids, specifically cubes. 2. Students will be introduced to prisms and how to calculate volume with such a figure. 3. Students will calculate volume of prisms. 4. Students will be introduced to cylinders and how to calculate volume with such a figure. 5. Students will calculate volume of cylinders. 6. Students will be introduced to pyramids and how to calculate volume with such a figure. 6. Students will calculate volume of pyramids. 7. Students will be introduced to cones and how to calculate volume with such a figure. 8. Students will calculate volume of cones. 9. Students will be introduced to spheres and how to calculate volume with such a figure. 10. Students will calculate volume of spheres. 1. Students will review lesson on lateral area and total area of prisms. 2. Students will calculate the lateral area and total area of many prisms using online, dynamic problem generator/checker. 3. Students who answer incorrectly will be made to review the online lesson before continuing with the online, dynamic problem generator/checker. 4. Students who continue to answer incorrectly will be made to seek avenues outside the classroom: personal tutoring and/or the continued use of the online tools beyond class hours. 5. Students will review lesson on lateral area and total area of cylinders. 6. Students will calculate the lateral area and total area of many prisms using online, dynamic problem generator/checker. 7. Students who answer incorrectly will be made to review the online lesson before continuing with the online, dynamic problem generator/checker. 8. Students who continue to answer incorrectly will be made to seek avenues outside the classroom: personal tutoring and/or the continued use of the online tools beyond class hours. 9. Students will review lesson on lateral area and total area of pyramids. 10. Students will calculate the lateral area and total area of many prisms using online, dynamic problem generator/checker. 11. Students who answer incorrectly will be made to review the online lesson before continuing with the online, dynamic problem generator/checker. 12. Students who continue to answer incorrectly will be made to seek avenues outside the classroom: personal tutoring and/or the continued use of the online tools beyond class hours. 13. Students will review lesson on lateral area and total area of cones. 14. Students will calculate the lateral area and total area of many prisms using online, dynamic problem generator/checker. 15. Students who answer incorrectly will be made to review the online lesson before continuing with the online, dynamic problem generator/checker. 16. Students who continue to answer incorrectly will be made to seek avenues outside the classroom: personal tutoring and/or the continued use of the online tools beyond class hours. 17. Students will review lesson on total area of spheres. 18. Students will calculate the total area of many prisms using online, dynamic problem generator/checker. 19. Students who answer incorrectly will be made to review the online lesson before continuing with the online, dynamic problem generator/checker. 20. Students who continue to answer incorrectly will be made to seek avenues outside the classroom: personal tutoring and/or the continued use of the online tools beyond class hours. 21. Students will review lesson on volume of prisms. 22. Students will calculate the volume of many prisms using online, dynamic problem generator/checker. 23. Students who answer incorrectly will be made to review the online lesson before continuing with the online, dynamic problem generator/checker. 24. Students who continue to answer incorrectly will be made to seek avenues outside the classroom: personal tutoring and/or the continued use of the online tools beyond class hours. 25. Students will review lesson on volume of cylinders. 26. 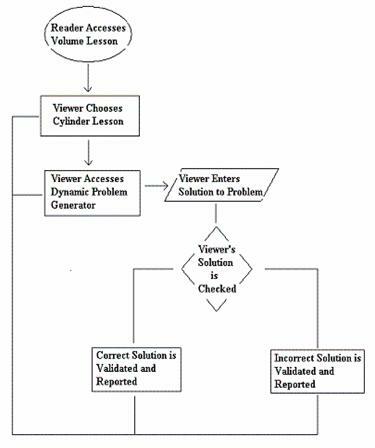 Students will calculate the volume of many cylinders using online, dynamic problem generator/checker. 27. Students who answer incorrectly will be made to review the online lesson before continuing with the online, dynamic problem generator/checker. 28. Students who continue to answer incorrectly will be made to seek avenues outside the classroom: personal tutoring and/or the continued use of the online tools beyond class hours. 29. Students will review lesson on volume of pyramids. 30. Students will calculate the volume of many pyramids using online, dynamic problem generator/checker. 31. Students who answer incorrectly will be made to review the online lesson before continuing with the online, dynamic problem generator/checker. 32. Students who continue to answer incorrectly will be made to seek avenues outside the classroom: personal tutoring and/or the continued use of the online tools beyond class hours. 33. Students will review lesson on volume of cones. 34. Students will calculate the volume of many cones using online, dynamic problem generator/checker. 35. Students who answer incorrectly will be made to review the online lesson before continuing with the online, dynamic problem generator/checker. 36. Students who continue to answer incorrectly will be made to seek avenues outside the classroom: personal tutoring and/or the continued use of the online tools beyond class hours. 37. Students will review lesson on volume and total area of spheres. 38. Students will calculate the volume of many spheres using online, dynamic problem generator/checker. 39. Students who answer incorrectly will be made to review the online lesson before continuing with the online, dynamic problem generator/checker. 40. Students who continue to answer incorrectly will be made to seek avenues outside the classroom: personal tutoring and/or the continued use of the online tools beyond class hours. Sections A - E above demonstrate a laborious route through lateral area, total area, and volume of solid figures. As described, students would learn concepts and skills in an extremely ordered manner. However, it is suggested that learners not adhere to a linear model. Most textbook authors spiral the content. For instance, the content found within section one of chapter one may also appear within sections two, three, and so on, so that all sections never abandon previous content. Content also spirals not only from section to section but from chapter to chapter, too. In an attempt to achieve the same level of integration of course content through spiraling, lateral area, total area, and volume content should be handled similarly. For instance, after completing lateral area and total area of both prisms (B2) and cylinders (B4), it is suggested that students be introduced to the online content of the same types (D1 - D8). Therefore, even though the above outline of activities appears to be linear, actually progressing through the course would involve a non-linear, yet logical, flow. An other suggestion would be to use D13 - D20 after covering B7 - B10. Students could also have material spiraled from surface area when reviewing volume. To review for a chapter test after completing C1 - C10, students can be guided to complete a set number of problems by completing routes D22 & D23, D26 & D27, D30 & D31, D34 & D35, and finally D38 and D39, in succession. As it can be seen, the possibilities for charting through the curriculum via enhancement with the online content are many. Each progression depends on students’ needs throughout the course. Below is a sample of a student’s direction through a volume lesson. Let it serve to provide insight as to the chain of events that can take place for a student who is using the volume online resources at MATHguide.com. The target learners for the online lessons on surface area and volume of solids are high school students at a certain high school in Illinois. Students from two different geometry courses will be affected. The two courses are directed toward: 1) college bound students and 2) students who may require hands-on activities. The online resources will be useful and appropriate for the two courses, which are called geometry 1/2 and geometry B 1/2, respectively. Students at a certain high school are predominantly Hispanic. The students who take geometry range between 15 to 18 years of age and are arranged in courses that are coeducational. In order for students to maximize their learning experiences, students should be capable of handling mathematical expressions using the order of operations. They should possess rudimentary study skills and classroom attitudes. Students who are motivated to learn will most likely make the greatest gains. It is assumed that the students who take geometry or geometry B have also passed an algebra level course. Consequently, these students should be able to handle algebraic expressions/equations, possess a sense for numbers, and be ready to apply numbers to physical situations. Specific to surface area and volume, students must be able to understand how to use formulas. Students who are able to comprehend how surface area and volume formulas are gained by using simple area formulas will be at an advantage. Due to the divergent nature of a diverse classroom, students should be able to participate in many activities that include independent study, cooperative learning, and question & answer. Students who are motivated and remain positive will gain the most from their experiences in geometry. Extrinsic demands are many for learning geometry, specifically surface area and volume. Learning the information is a requirement of the course, which leads to receiving credit toward graduation. Learning the information is also a requirement of surviving and thriving in our technological society. Intrinsic demands may stem from students wanting to achieve either a labor job that involves surface area and volume, namely the varied fields within construction. Students may also find the knowledge valuable for performing home repairs with requires an intimate knowledge of spatial figures and the various formulas that quantify their use. Students are able to learn geometry as a result of instruction by attending class, which is limited to the spaces available at a certain high school and the allotted time for each class. The space that is available is limited to the classroom, computer labs, the open spaces available on and around the campus, and possibly environments that are applicable for field trips. Time is limited to 50 - 60 minute increments, save for experiences related to field trips. The time and space restrictions place difficulties on the learning experience. Transmission of geometry knowledge can be a less than stimulating practice when physical situation are not immediately present. Ideally, construction sites, architectural tours, and physical objects make discussions and applications within geometry more productive. The limits on time prevent class projects from being fluid; however, extended projects can be accomplished, but start-up and other clean-up activities may prolong the activities. In such a case, extended projects should take in to effect time demands. The online content that will supplement the courses is a means for breaking the traditional time limitations. Students can use time outside of the course for reading lessons and partaking in dynamic activities at MATHguide [ http://www.mathguide.com/ ]. If students are having difficulty understanding the relationships that exist between basic two-dimensional figures and three-dimensional solids, students can research the information from the online lessons. The online content that will be created is a support mechanism for the course content. The nature of the online content allows students to read, reflect, and calculate at rates that are comfortable to the individual needs of each student. The online content will be created to exactly replicate the information that will be learned in class. The nature of the dynamic interface device will be a useful supplementary aid. Students can use the dynamic content to verify whether or not they actually understand how to use the formulas learned in class and online. Students can use the dynamic content to study for chapter tests. Students can also use the dynamic content to retain information for purposes of studying and relearning for the semester final exam. The nature of the typical geometry student at a certain high school is driving the delivery strategy. Students typically have low reading and computation skills. Therefore, providing them with individualized and lengthened learning opportunities could best help students. Since many students do not immediately understand computational tasks that involve surface area and volume of three-dimensional figures, extended reading and computation strategies rule lesson development. This means that students will be allowed to read various lessons on surface area and volume, at their own rates. It also means that students will be asked to carry out various computational tasks to verify whether or not they are accurately performing the calculations. The lesson will consist of an introductory page that leads readers to either surface area or volume. Once a decision is made, the reader will be led to an extensive lesson. The lesson will contain multiple examples that include detailed calculations along with a rationale. Students will then be invited to partake in a dynamic calculation checker to verify their work. This material is supplemental to the course content. There is absolutely nothing unique to the online material compared to the class materials, discussions, and presentations. It exists to aid students who need more time, which is not a problem and possible solution that is specific to this school's students. Therefore, students will be exposed to a classroom environment that will use many strategies, only one is the work produced from this project. Students will have opportunities to develop their own strategies by using Socratic techniques. Students will work with each other cooperatively. Finally, online and instructional assistance will be provided through the project goals that have been detailed above. a. Learners will differentiate solids. b. Learners will engage in various calculations related to solids at their own pace, which will stem from their knowledge of areas of figures. c. Learners will use the fundamentals of calculating surface area and lateral area of solids. d. Learners will use the fundamentals of calculating volume of solids. e. Students will self-test, and modify if necessary, calculations related to solids and do so as a result of their own individual pacing needs. f. Students will use formulas for calculating surface area and volume of complex solids using knowledge that was learned on basic solids. a: Learners will differentiate solids. Initial Presentation: I will review terms such as point, segment, and plane. Students will then be shown solids such as a pyramid, cylinder, sphere, cone, and prism. Generative Strategy: Students will be asked to differentiate the figures using previous terms. Discussion will naturally evolve toward edges, faces, and points. b: Learners will engage in various calculations related to solids at their own pace, which will stem from their knowledge of areas of figures. Initial Presentation: I will review how to find areas of rectangles, squares, triangles and circles. Generative Strategy: Students will be asked to find the areas of faces of various solids. Other students will be asked for feedback concerning the calculations. c: Learners will use the fundamentals of calculating surface area and lateral area of solids. Initial Presentation: I will present the distinction between lateral area and surface area of solids, while offering formal definitions. Generative Strategy: Students will be asked to find the surface areas of various solids. Other students will be asked for feedback concerning the calculations. d: Learners will use the fundamentals of calculating volume of solids. Initial Presentation: I will present the notion of volume by having students draw or physically form prisms using cubes. Students will start with a number of cubes that form a prism using a single level. Next, they will create taller prisms by extending the height of the original prism by adding a new level of cubes, like adding a story to a building. Generative Strategy: Students will be asked to carry this reasoning over to existing prisms of given dimensions. Students will be asked to fill these prisms with cubes. Students will count the cubes per level or story of prism. Students will eventually be led to determine a formula by carrying out this process on prisms of different shapes. e: Students will self-test, and modify if necessary, calculations related to solids and do so as a result of their own individual pacing needs. Initial Presentation: Students will be told how to conduct themselves in the computer lab. Students will be handed an exercise sheet and told to accomplish the tasks on the sheet. Generative Strategy: Students will be given self-paced exercises that utilize dynamic online interfaces at MATHguide.com. The 'quizmasters' will test student understanding by displaying solids of random dimensions, allowing students to enter in volume amounts, and finally checking their solutions. The 'quizmasters' are accompanied by lessons in the case that students need to review certain formulas and strategies. f: Students will use formulas for calculating surface area and volume of complex solids using knowledge that was learned on basic solids. Initial Presentation: I will review how to find the surface area and volumes of a cone and a cylinder that both have the exact same radii. Generative Strategy: Students will be asked to find the surface area and volume of the resulting figure formed by the unity of the two separate solids. Other students will be asked for feedback concerning the calculations.